Lake Fork Reservoir is located 65 miles east of Dallas on the on Lake Fork Creek, a major tributary of the Sabine River between Quitman, Alba, Emory, and Yantis, Texas. 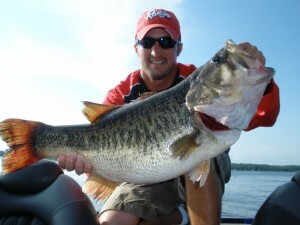 Call (903) 736-9888 for the ultimate experience: Lake Fork Trophy Bass Fishing with Pro Guide James Caldemeyer! Location: Approximately 75 miles east of downtown Dallas, five miles west of Quitman, just east of U.S. Highway 69. Description: The dam impounds Lake Fork Creek, a tributary of the Sabine River. Other major creeks are Big Caney and Little Caney. The water is usually stained to moderately clear, with widespread distribution of hydrilla and other flooded vegetation. Most standing timber was left in the original reservoir basin. TPWD Fisheries Office: Old Henderson Hwy, Tyler, TX 75701, (903) 593-5077. 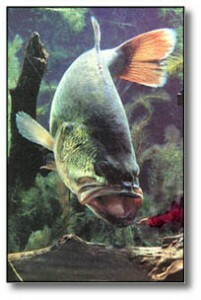 Largemouth bass — Five per day, none between 16 -24 inches. One bass over 24 inches. Crappie — From December 1 to last day of February, no minimum, no culling, 25 per day. All others same as statewide. Comments: From the start, this was textbook fisheries management, including initial stocking before the lake filled, leaving most of the standing timber and filling in stages. Then, the fish were protected from over-harvest by a minimum length limit that became a “slot limit,” to help make Fork the premiere trophy bass lake in Texas, perhaps in the nation. It has also been one of the top crappie and sunfish lakes. Facilities: Good public and private boat ramps, but no public campgrounds. Numerous private lodges and marinas have RV and tent camping. Largemouth bass are the most popular sportfish in this reservoir. A combination of restrictive harvest regulations, stocking of Florida strain largemouth bass, and good habitat has contributed to Lake Fork’s development as one of the country’s premier trophy bass lakes. More than 65% of the Texas Top 50 largest bass (including the current state record) and more than half of those entered in the Budweiser ShareLunker Program, were caught from Lake Fork. Crappie fishing is generally good, especially in standing timber and under the lake’s numerous bridges. Channel catfish provide an excellent sport fishery, though this remains a well-kept secret. Sunfish, primarily bluegill, offer additional angling opportunities during spring and summer.